As also, the Answer of Sir James Kinloch Baronet and Dame Mary his Wife, to the same Appeal. Sir H. Dalrymple against Buchan. As was also, the Answer of Mary Buchan Spinster, One of the Respondents to the Appeal of Sir Hew Dalrymple Baronet. New Respondents to be made to Murray's Appeal. A Petition of Alexander Hamilton, Agent for Mr. Hugh Murray Kynnynmound and others, was presented, and read; setting forth, "That they are advised, it is necessary to make Sir Francis Kinloch Baronet and Dame Mary his Wife, and Sir James Dalrymple Baronet, Respondents to their Appeal; they being Parties in the Court below, though they made no Defence;" and praying, "That the Petitioner may have Leave forthwith to amend the said Appeal accordingly, but not to put off the Hearing of the Cause." Ordered, That the Petitioner have Liberty to amend the said Appeal, as desired, by adding the said Parties as Respondents; but not to put off the Hearing of the Cause as at present appointed. Hodie 2a vice lecta est Billa, intituled, "An Act for enlarging the Term and Powers granted and given by an Act passed in the Twelfth Year of the Reign of His late Majesty King George, for repairing the Road from Lemsford Mill, in the County of Hertford, to Welwyn, and from thence to Cory's Mill, and from Welwyn (through Codicot) to Hitchin, in the said County; and also for repairing the Roads from Cory's Mill to Hitchin aforesaid." V. Falmouth. L. Abp. Cant. L. B. Bangor. L. Clinton. 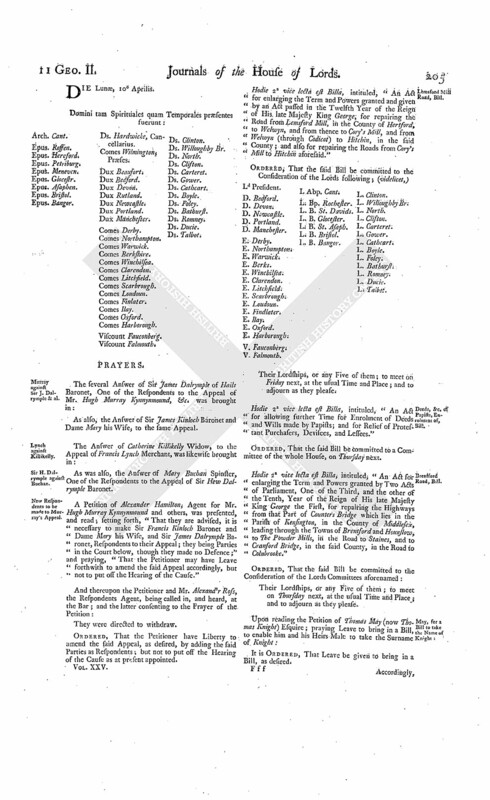 Deeds, &c. of Papists, Enrolment of, Bill. Hodie 2a vice lecta est Billa, intituled, "An Act for allowing further Time for Enrolment of Deeds and Wills made by Papists; and for Relief of Protestant Purchasers, Devisees, and Lessees." Hodie 2a vice lecta est Billa, intituled "An Act for enlarging the Term and Powers granted by Two Acts of Parliament, One of the Third, and the other of the Tenth, Year of the Reign of His late Majesty King George the First, for repairing the Highways from that Part of Counters Bridge which lies in the Parish of Kensington, in the County of Middlesex, leading through the Towns of Brentford and Hounslow, to The Powder Mills, in the Road to Staines, and to Cranford Bridge, in the said County, in the Road to Colnbrooke." Accordingly, the Lord Willoughby de Brooke presented to the House a Bill, intituled, "An Act to enable Thomas May Esquire and his Sons, and the Heirs Male of their Bodies, to take and use the Surname of Knight, pursuant to the Will of Elizabeth Knight, deceased." Hodie 2a vice lecta est Billa, intituled, "An Act for continuing of an Act made in the Sixth Year of the Reign of His present Majesty, intituled, An Act for the better Regulation of Lastage and Ballastage, in the River Thames." Prisoners for Debt, for relief of, Bill. Hodie 2a vice lecta est Billa, intituled, "An Act for Relief of such Prisoners for Debt as have, by unavoidable Accidents, lost the Benefit of an Act passed in the last Session of Parliament, intituled, "An Act for Relief of Insolvent Debtors;" and for the Indemnity of such Sheriffs and Gaolers as have incurred any Penalties on account of such Prisoners not being discharged; and for extending the Benefit of the said Act to Creditors, whose Debtors were committed to Prison since the First Day of January One Thousand Seven Hundred and Thirty, and were detained there upon the First Day of January One Thousand Seven Hundred and Thirty-six, and have chose to continue there." Meux to take the Name of Massingberd, Bill. Hodie 2a vice lecta est Billa, intituled, "An Act to enable William Massingberd Esquire, heretofore called William Meux, and the Heirs Male of his Body, to take and use the Surname of Massingberd, pursuant to a Settlement made by Sir William Massingberd Baronet, deceased." Their Lordships, or any Five of them; to meet on Friday next, at the same Place; and to adjourn as they please. Lynch against Killikelly & al. The House being moved, "That a Day may be appointed, for hearing the Cause wherein Francis Lynch Merchant is Appellant, and Martin Killikelly and others are Respondents:"
Hodie 2a vice lecta est Billa, intituled, "An Act to enlarge the Term and Powers granted by an Act of Parliament made and passed in the Third Year of the Reign of His late Majesty King Gearge, intituled, An Act to enable the Parishioners of the Parish of St. Mary, Rotherith, in the County of Surrey, by certain Funeral Rates therein mentioned, to finish the said Parish Church; and to enable the said Parishioners to raise such further Sums of Money as shall be necessary for purchasing a convenient Piece of Ground for an additional Burial Ground; and for other Purposes therein mentioned." Bernard & al. to be naturalized. Burke against Blake; and Hampson against Mervin: Pleadings proved. The House being informed, "That Mr. Brereton attended, in order to deliver in Copies of several Pleadings and Proceedings, in the Cause wherein Gerald Burke Esquire is Appellant, and Thomas Blake Respondent; and in the Cause wherein Dillon Pollard Hampson Esquire is Appellant, and Arthur Mervin and others are Respondents:"
The House was also informed, "That Mr. Dalton attended, in order to deliver in Copies of certain Papers and Proceedings, in the Cause wherein Thomas Earl of Westmeath is Appellant and John Madden Respondent." Whereupon he was called in; and delivered the same at the Bar; and attested upon Oath, "They were true Copies, he having examined them with the Originals in the proper Office in Ireland." 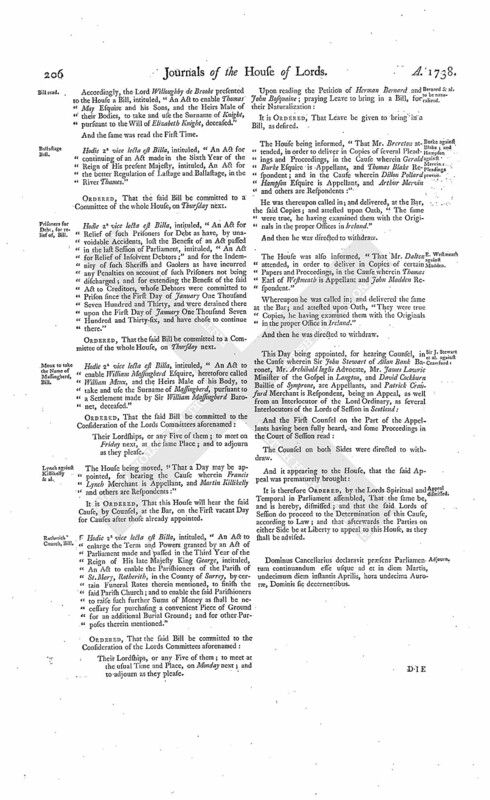 It is therefore Ordered, by the Lords Spiritual and Temporal in Parliament assembled, That the same be, and is hereby, dismissed; and that the said Lords of Session do proceed to the Determination of this Cause, according to Law; and that afterwards the Parties on either Side be at Liberty to appeal to this House, as they shall be advised. Dominus Cancellarius declaravit præsens Parliamentum continuandum esse usque ad et in diem Martis, undecimum diem instantis Aprilis, hora undecima Auroræ, Dominis sic decernentibus.